The nineteenth century was a time when frugality was valued. The ladies' magazines had numerous tips about how to make your own homemade substitutes for store-bought items or do prepare a menu item using less expensive or more readily available ingredients. In the South, When the blockade became more effective and a large portion of the prime workforce was enlisted in the army, frugality probably became a badge of patriotism. Hence a book promoting ways to "make do" with materials that were available. 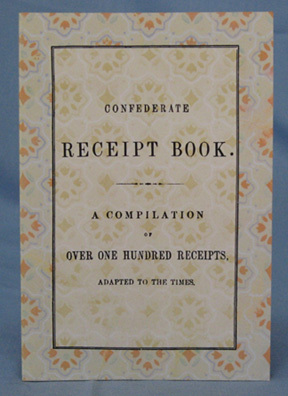 Some recipes include making a Confederate candle (there are some good examples in the collections of the Museum of the Confederacy) and making an "apple" pie with crackers. For this last recipe, in case you are scoffing, we can vouch that it really works. We fixed a pie using an almost identical recipe and our son couldn't tell the difference.